Book a room at DoubleTree by Hilton Hotel Charlotte Airport, where a friendly member of our staff is waiting to greet you with a warm, chocolate chip cookie. 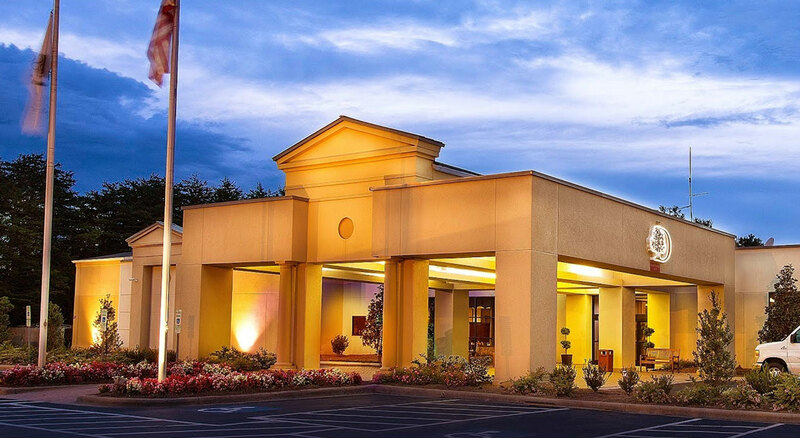 Located amid beautiful surroundings, our hotel is convenient to Charlotte Douglas International Airport, just 4.5 miles away. Other nearby attractions include uptown Charlotte, South Park Mall, Carowinds, Spectrum Center and Bank of America Stadium. Each guest room features a 39-inch flat-screen TV, WiFi and a large work desk with an ergonomic chair. Accessible rooms are available. Hold your business meeting or social event in one of our eight venues. The elegant ballroom can accommodate up to 200 guests. Exercise in the fully equipped fitness room or tone your body by swimming in the saline pool. Our hotel restaurant, Treetops Cafe, offers delicious American cuisine and is open for breakfast, lunch and dinner. Order room service and dine in the comfort of your guest room.